Do you want to feed birds but always seem to end up with pesky squirrels trying to spoil the fun? Well, we’ve had this problem as well, and fortunately, we’ve created this top-three list of bird feeders that keep squirrels OUT! We’ve hand-picked these products and performed all of the research, which should save you countless hours of your time. If you’re curious, this is the BEST squirrel-proof feeder. We used a number of different criteria to select these products, which is based on product durability, consumer reviews and several other criteria. All you have to do is decide what product is right for your needs and purchase it. 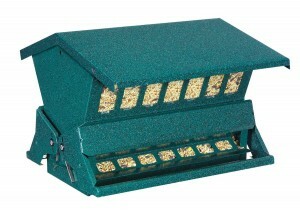 For the #1 pick, we ended up choosing the Brome 1024 Squirrel Buster plus Wild Bird Feeder. Although it’s quite a bit more expensive than other models, it excels in so many different areas that we had to make it #1. It’s squirrel-proof and holds three quarts of bird seed. If a squirrel tries to access it, the squirrel’s own weight causes it to close and deny access to him. The weight setting that is used to deny access to squirrels can also be adjusted. Since the Brome 1024 Squirrel Buster has a cardinal ring perch, it attracts a wealth of different birds, so you’ll have plenty of birds for your viewing pleasure. You can place the product anywhere, and it’s very easy to clean; it can even be cleaned in a dishwasher. Also comes with a hassle-free warranty. Let’s take a look at the pros and cons. For starters, the Brome 1024 Squirrel Buster has a massive capacity, so you don’t have to worry about filling it very often. The platform makes it nearly impossible for squirrels to stand on it, and even if they manage to do so, their own weight causes them to be denied access to the seeds. This is truly an ingenious mechanism. However, since the mechanism can be adjusted, you can adjust it to deny access to larger birds if you want, such as grackles and starlings. 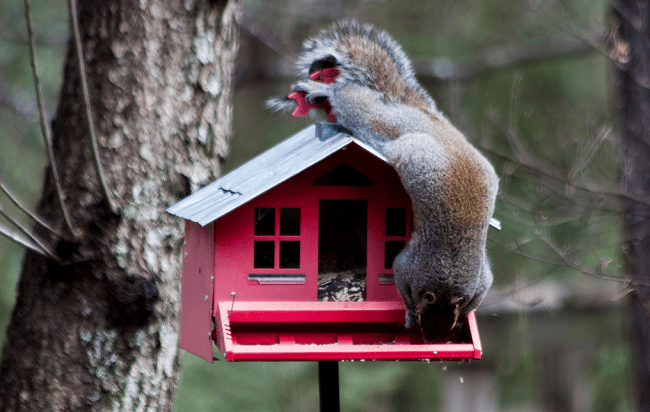 The thing is – many other products claim to stop squirrels from breaking into the feeder, but after a month or two, customers are left with a broken feeder, or the feed is eaten so quickly by larger birds and squirrels that the desired birds cannot get any of it. The Brome 1024 Squirrel Buster ACTUALLY stops this from happening. It performs exactly as it should. The only minor issue with this product is the fact that some birds have trouble getting used to it. For example, they have to stick their heads into the feeder, and it can take some time for them to learn to do this. Overall, this is an excellent product. It goes above and beyond keeping squirrels out, it’s durable and it comes with a lifetime warranty. If any of the parts fail, the manufacturer will replace them. Some consumers might be hesitant to splurge on this type of product, but they have every reason to do so. For our second choice, we decided on the Brome 1015 Squirrel Buster Classic. Since this product is from the same company as the #1 choice, it offers many of the same features. The #1 product is basically an upgrade of this ‘classic’ version. At nearly half the price, this selection is squirrel-proof, like the other choices. However, it holds 1.4 quarts of seed, which is about half of what the #1 choice holds. As is the same with other feeders from the same company, the mechanism that denies squirrels access to the bird feed is weight. The product is designed to deny access to any animal that is too heavy, and the weight mechanism can be adjusted to keep out not just squirrels but larger birds as well. This product also comes with a negative grip tube for additional protection. The beauty of this product is that it blocks squirrels but doesn’t harm them. Let’s look at the pros and cons. The greatest benefit of this product is durability. Although it has no problem keeping squirrels and large birds away from the seed, it will last for much more than a single season. Many comparable feeders only last for about one season before they break. There are some very aggressive and smart squirrels out there, and they can break into many so-called squirrel-proof feeders – but they won’t be breaking into this one. Like the #1 pick, it’s easy to clean. It has great durability, is easy to clean and works exactly as advertised. What more could you want, or get, from this type of product? The only minor issue that some customers have had involves the long cable that holds the feeder. Depending on where the product is hung, the cable is so long that it can cause it to hang into bushes. However, this isn’t a problem for MOST people. Overall, the Brome 1015 Squirrel Buster Classic is an excellent product, and it’s much higher quality than many of the other products out there. It’s about half the price of the newest model from Brome, and it performs just as well. 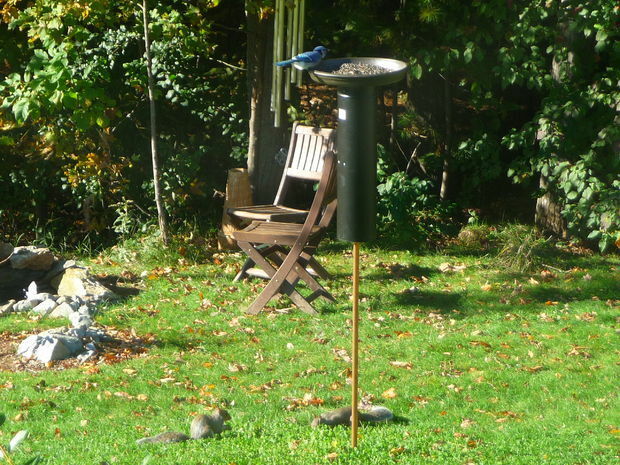 For our third choice, we went with the Heritage Farms Absolute II Squirrel Proof Bird Feeder. It’s made by a different company than the other two products on the list, but it performs flawlessly. There are several different reasons why we chose this one and none of the competing models. For starters, it has a durable, powder-coated steel body. The hanger and pole-mounting hardware are included with purchase. It has a locking top, which many other products lack. It also has a baffle that prevents bird seed from being wasted. It can hold a whopping 12 pounds of bird seed, so it doesn’t need to be refilled often. Here are the pros and cons. There are plenty of benefits to mention. It’s extremely massive, so it will feed a lot of birds over a long period of time. It holds 12 pounds of mixed seed, so it doesn’t need to be refilled for a VERY long time. It’s easy to use and doesn’t take much effort to fill. Although it’s quite large, it isn’t overly difficult to clean. It has a special locking mechanism that keeps squirrels out, and this mechanism defeats even the smartest, most persistent squirrels. The price is about middle-range, and is worth every penny. It’s our #3 choice because although it’s a superb product it falls a bit short from the #2 and #3 choices. The only real problem with this feeder is that it has some components that aren’t nearly as durable as the same components from other versions of this feeder. However, this isn’t a serious issue. Overall, this product does what it’s supposed to do, and it will keep pesky squirrels out while giving you a great view of the birds that eat from it.